This presentation highlights the key elements of the topic and shows how they link together. This presentation shows the different features of a drainage basin. This presentation looks at the four main methods of river transportation. 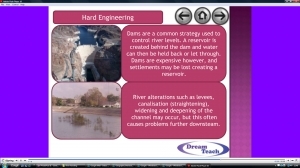 This presentation compares a river in its upper, middle and lower courses, focussing particularly on the processes that occur. This animation highlights the difference between vertical and lateral erosion. This animation demonstrates the formation of waterfalls, and their retreat up stream. This presentation demonstrates the formation of meanders, and includes an animation showing the development of a meander into an ox bow lake. 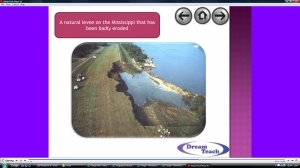 This presentation looks at levees and their formation. It includes and animation showing their development. 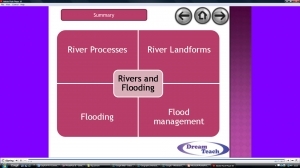 This presentation looks at flooding. It focusses on the physical and human causes, as well as the soft and hard engineering strategies that can be implemented to try and manage flooding. This presentation compares the effects of river flooding in Boscastle and Mozambique. 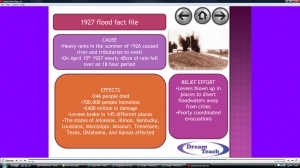 This presentation looks at two major floods on the River Mississippi, in 1927 and 1993, as well as general information about the Mississippi.